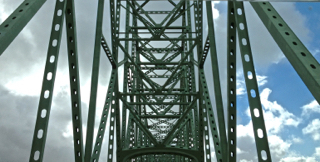 Ah, Oregon here I come. Continuing my journey south today, I will re-enter Oregon and be back on the coast at a place called Rockaway Beach RV park in the little seaside town of Rockaway. This may become one of my favorite places because I will be able to just step outside my little home on wheels and walk to town or to the beach or on a trail. 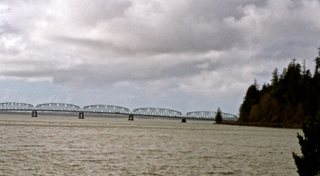 On my way to Rockaway, I stopped at a rest area right before crossing a 4 mile long bridge over the mouth of the Columbia River from Washington to Astoria, Oregon. In all my 9 years of travel with all the stops at rest areas on all the highways in all the states, this is the first time I have ever seen this little bit of cheer greeting me. 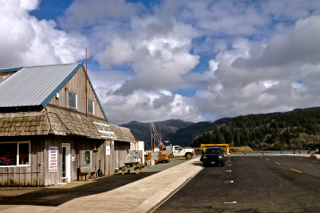 After setting up at my campsite in Rockaway, I drove to the seaport town of Garibaldi for fresh caught Dungeness crab. Back at camp I put the crab on ice and packed a BLT into my vest for a long walk on the beach just across the road from the park. 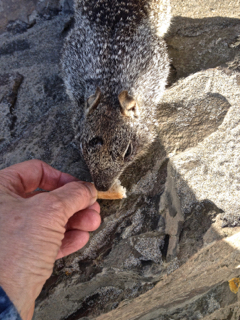 While sitting on some rocks eating my sandwich some inquisitive rock squirrels (little beggars) appeared. I fed them most of the sourdough bread from my lunch. A piece of bacon fell, I picked it up and offered it to a squirrel but it turned up its nose, only wanting bread. So now I know squirrels do not eat pig. Sounds logical. On the beach I found tens of thousands of tiny jellyfish, less than an inch long strewn all along the sand. 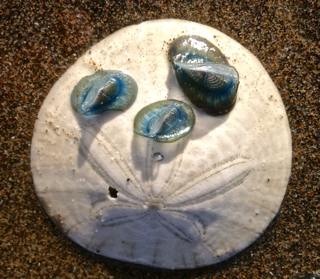 I placed some on a sand dollar for a better photo. They are purple sailor jellyfish. If you look closely, you can see their little sails. Beautiful pictures Anne. Sounds like you are having a great time there. Thanks for sharing your adventures with me. 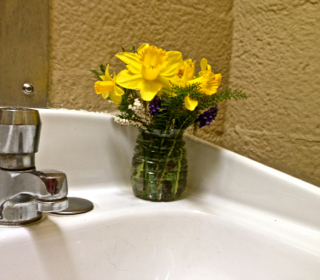 You are with me in spirit, Sher! Did you find the sand dollar there? Yes, it was lying on the beach.